Oh no they didn’t dare. Tell me this is just a bad joke. This is a bad joke, right? No. Apprently not. 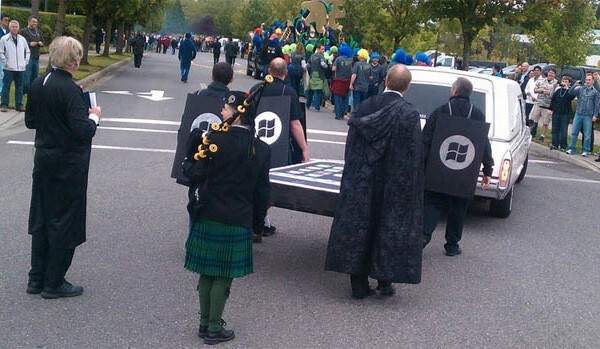 Microsoft marketing department has so much money and so little creativity that they put up a funeral parade for Blackberry and iPhone in celebration of the launch of Windows Phone 7. This is just the most pathetic attempt at generating buzz for a product. I seriously hope that someone got canned at MSFT for approving this desperate parade. It can’t be worse than that. Oh wait, yes it can! They also engaged in a Thriller dance.